Hulu's 'The Handmaid's Tale' season two takes a risk. Will it work? Now that the prescience (and the shock) of the first season has worn off, “The Handmaid’s Tale” has a big job ahead of it. Hulu’s first major original hit, “The Handmaid’s Tale” debuts its second season on April 25, in an attempt to replicate lightning in a bottle. The show is riding high on a wave of great publicity and accolades, including its Best Drama Emmy win last year; “Handmaid’s Tale” is the first show from a streaming service to win. Meanwhile, Elisabeth Moss practically swept the year's Best Actress awards for her lead role, taking home an Emmy a Critic’s Choice Award and a Golden Globe. The show was further aided by the not-so subtle ties between the beginning of the Trump era and the show’s oppressive plot. But now that the prescience and the trauma of the first season has worn off, “The Handmaid’s Tale” has a big job ahead of it: Hulu has staked its reputation on Margaret Atwood’s dystopian empire, but what happens when the show moves beyond the borders of the book that birthed it? The story, with its themes of extreme government overreach and uber-patriarchy, honed in on the rage and fear of an American populace coming to terms with its newly elected president. There’s no doubt that the show’s first season, which arrived at the end of April 2017, was extraordinarily lucky in its timing. The story, with its themes of extreme government overreach and uber-patriarchy, honed in on the frustration and fear of an American populace coming to terms with its newly elected president. 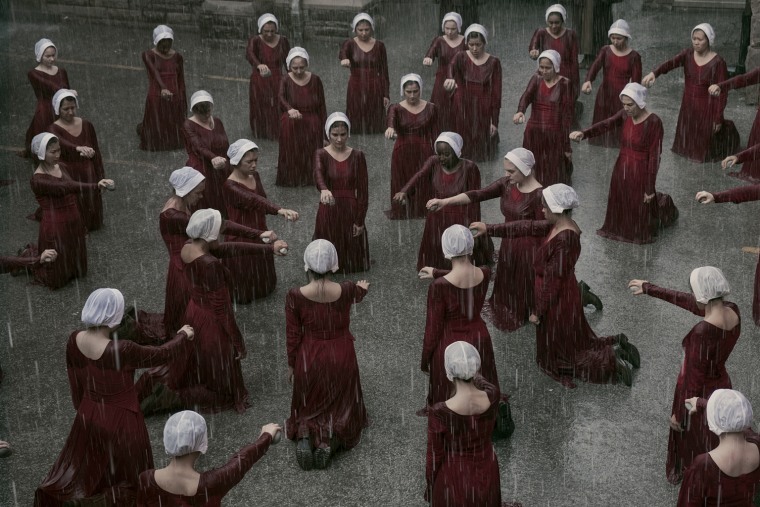 Focusing on the story of the Handmaid Offred (played by Moss), a fertility slave to the rich and powerful (and sterile) Waterford family (Joseph Fiennes and Yvonne Strahovski), the story envisions a post-American dystopia in the aftermath of a theocratic coup and the creation of the New England-based Republic of Gilead. When “The Handmaid’s Tale” started filming in September of 2016, many people guessed it would be released right around the time our first female president was celebrating her 100th day in office. Instead, the show debuted a week before the House voted to repeal Obamacare and tried to take women's reproductive healthcare rights along with it. Coming on the heels of months of protests of the new administration’s policies, the screener link literally arrived in my inbox on the heels of an email from the Democratic Congressional Campaign Committee warning “Trump Signs Executive Order Allowing States To Defund Planned Parenthood.” You cannot buy this kind of PR. But because a second season was not originally assured, the first season used up all the content of the original novel, and then some. Where they stuck to the story tightly — the first three episodes and the season finale — the show achieved horror-show levels of relentlessness and terror. At the time, I likened it to being punched in the face repeatedly. But one cannot keep punching your audience in the face — not for an extended period and not if you want that same audience to keep tuning in. By the back half of the season, the show was already exploring how to dramatize parts of the novel which are alluded to but don’t exist on the page. These episodes were generally gentler to watch, even if the reality of Gilead remained awful. Now showrunners have created an entire season built on that wobbly space. One cannot keep punching your audience in the face — not for an extended period and not if you want that same audience to keep tuning in. The new season picks up exactly where last season ends (as well as the novel), so do not read further if you want to avoid spoilers. Offred is being whisked away to parts unknown in a government van, pregnant with a baby the Waterfords claim as theirs, even though she actually conceived it with the household chauffeur Nick (Max Minghella). From the beginning, the tone of this season feels more like the mushy-middle of last season, but that’s not necessarily a bad thing. And while the first ten minutes try to recreate the “punch you in the face” mentality, but it doesn’t really work. After so many punches, the shock and awe tactic loses effectiveness. On the other hands, now the show can spend a lot more time world building, adding in areas like “The Colonies” and the suburbs where “The Econo-People” live, filling out its depiction of society beyond the ultra-rich and their servant classes. There is also more room to focus on the plot’s emotional ramifications; the suppressed rage of the citizenry and the deep-set trauma inflicted by Gilead’s leaders comes across much clearer. Obviously, creating sequels for a beloved fictional work is risky. (Does anyone remember “After MASH” or “The Bradys?”) There’s also the fact that some huge successes simply cannot sustain more than a single season. For instance, “True Detective” season two was a flop, and over on STARZ, “American Gods” has gone through a similar dilemma — its second season is postponed until 2019. But “The Handmaid’s Tale” showrunners are now able to go places and discuss topics that author Atwood didn't. When this works, it really adds to the plot and character development. For example, we’re reintroduced to the character Moira (Samira Wiley), now living in the refuge of “Little America” in Canada. This is a place and a perspective we would have never seen in a story told directly through Offred’s eyes. The show also gets to dive into themes that weren’t part of the conversation in 1985, when the book was written. This comes across most forcefully through the story of the former Ofglen, Emily (Alexis Bledel), as she experiences the rollback of LGBT rights. This plotline is also used as an opportunity to explore how the older members of the community feel upon seeing all of their hard-won rights being taken away. As was true of season one, “The Handmaid’s Tale” ultimately reminds viewers not to wait for others to act for you, but to seize the day and fight for change. This is not to say Offred’s role is any smaller in season two. Perhaps one of the most moving parts of the new series comes when we flashback to her relationship with her mother (Cherry Jones). Offred's mom, it turns out, was an old-school 1960s era feminist, whose deep disappointment with her daughter stemmed from the fight between first and second wave feminists. Offred took women’s rights for granted, while mom was out in the streets fighting the possible rise of Gilead even before it took control of the government. As was true of season one, “The Handmaid’s Tale” ultimately reminds viewers not to wait for others to act for you, but to seize the day and fight for change — and to keep fighting, lest someone ever tries reverse your progress. As Trump’s chaotic term continues, it’s important to remember that the only way the arc of history bends in our direction is through hard work and constant vigilance.